Last weekend we made a road trip back home to spend time with family for Easter. My travel attire was a mixture of comfort, ease and functionality. When making a three hour trip with high energy children and a car packed full of more than what we really need, I want to make sure I am wearing pieces that are comfortable and easy to move around in...plus a pair of shoes that are easy to slip on and off for pit stops. I posted a picture on Instagram at one of our many highway stops and got a few questions about the top I was wearing. I purchased this ruffled bottom tee at J.Crew Factory a few months ago. Unfortunately, it is long gone. I did find a few options that are super similar. Hopefully, the ladies that asked will find one that they like just as much in the line up below. By they way, I cannot get enough of these Old Navy sandals. I am actually wearing them again today and have a feeling I am going to grab another set just in case I wear out this pair before Summer even begins. 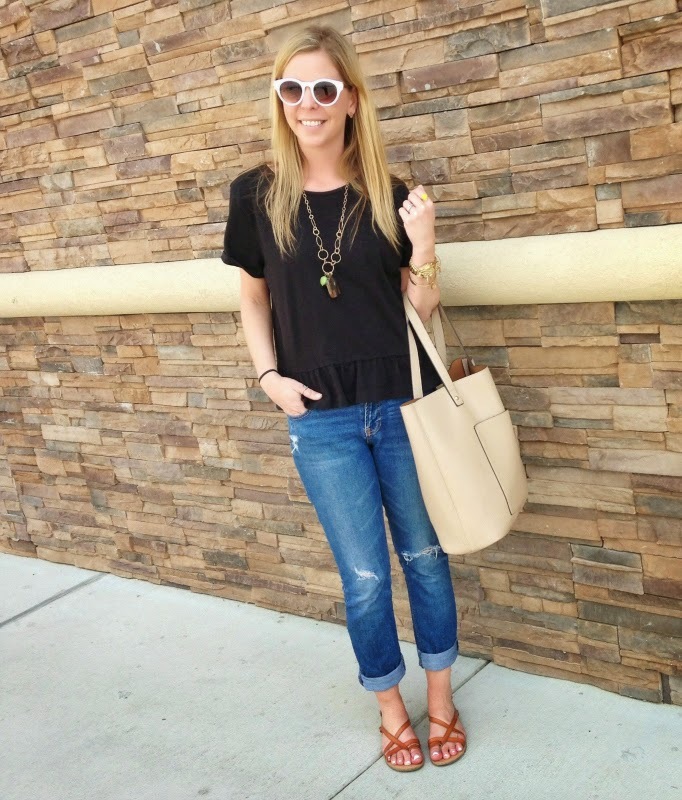 Love the entire outfit, Shanna! Those jeans are perfectly distressed. Old Navy has been coming out with so many great items recently. Have a wonderful day! This outfit is too cute! And I am in love with those sandals - they would match everything!! Soooooooooo cute. I LOVE that top! And those sandals are awesome. I need them. Now. Adorable and perfect for travel! And how cute are those white sunglasses on you?! So so cute!! 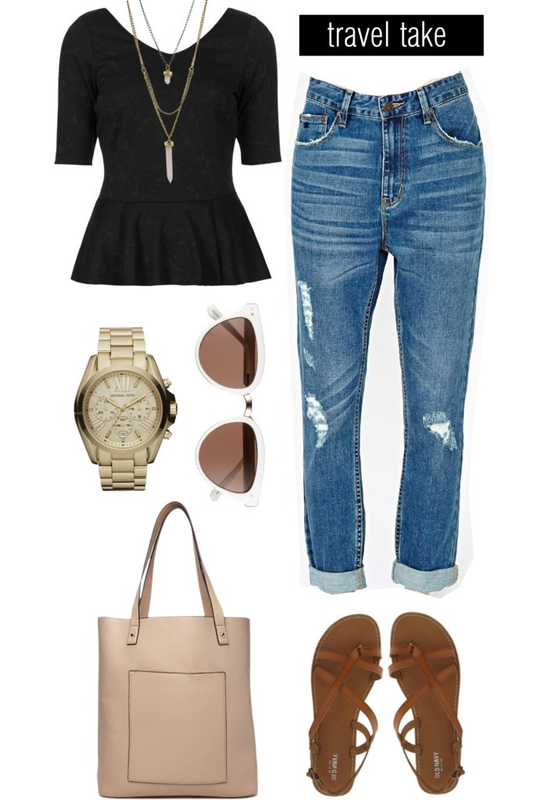 Definitely been craving some simple, casual style like this lately! I have gotten so many ruffled tops this season. They're all so comfy but cute- also, those sandals... they are definitely stylin'. This is a perfect travel outfit. Casual and cute! This is such a cute travel outfit! I love the distressed jeans! this is absolutely perfect- casual and cute. I think I NEED this top. While this is the perfect travel outfit, I would totally wear this just about any day! I need to head over to Old Navy and get me a pair of those sandals!!! Lookin' adorbs as always! I'm loving everything about this outfit! The sandals look so comfortable and I love the color. I so need to get a pair of boyfriend jeans! They're the first thing on my "to buy" list for when I'm not pregnant anymore! That really is the perfect traveling outfit - love it. That is the perfect travel outfit! We are going to Chicago in a couple of weeks (a six hour car ride, yikes), and I will probably wear something very similar! This is a perfect road tripping outfit! So chic! And I loveeee those sandals! All such super cute tops! They look so comfy and chic! This look is perfect for traveling and super chic! Love this outfit, the top is ADORABLE! Perfect traveling outfit and I think I might get myself a pair of those sandals! love all the items but ripped jeans are really amazing! perfect for travel! seriously, you can do no wrong. if I ever look this cute on a road trip it will be a miracle. i also saw your photo in this month's InStyle -- you rocked the jumpsuit! I've been looking for some simple summer sandals. Do they come in black as well? I would get both! I love this. We just booked a trip to San Francisco I might have to get this outfit. I am so glad to be back from my business trip and getting a chance to get caught up on your blog.